Leading Manufacturer of glass distillation training unit from Ambala. 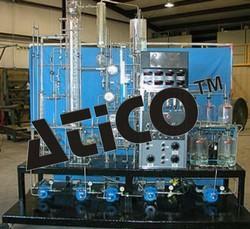 Advanced Technocracy Inc. is Manufacturer, Exporter & Supplier of Glass Distillation Training Unit. This actual working glass distillation unit is our full size model. The PU-004 is state of the art in teaching process distillation, incorporating a stripper column as well as the main column and includes a custom chilled water unit. Looking for Process Units ?